Spring is here, relax, bask in the lovely 7°C ! All things are relative. While the prospect of an Autumnal temperature plummet to seven degrees may cause us to shudder at the very thought, reaching in vain after warm memories of summery 18 degrees and above; here at the back end of Winter and in the wake of winds from Siberia, 7 degrees is greeted with excitement and delight! “It’s lovely now it’s warmed up” is not mere winter swimmer’s bravado, it is heartfelt. 10 days ago the shallow salt water dipped below zero. True, we still have that glazed look of the mildly hypothermic as we hug our hot drinks. True it is drizzling, and an icy wind is promised for the weekend. But all things are relative, and these things are mere blips in the unstoppable onrush of spring. Very soon, it will be too warm…. 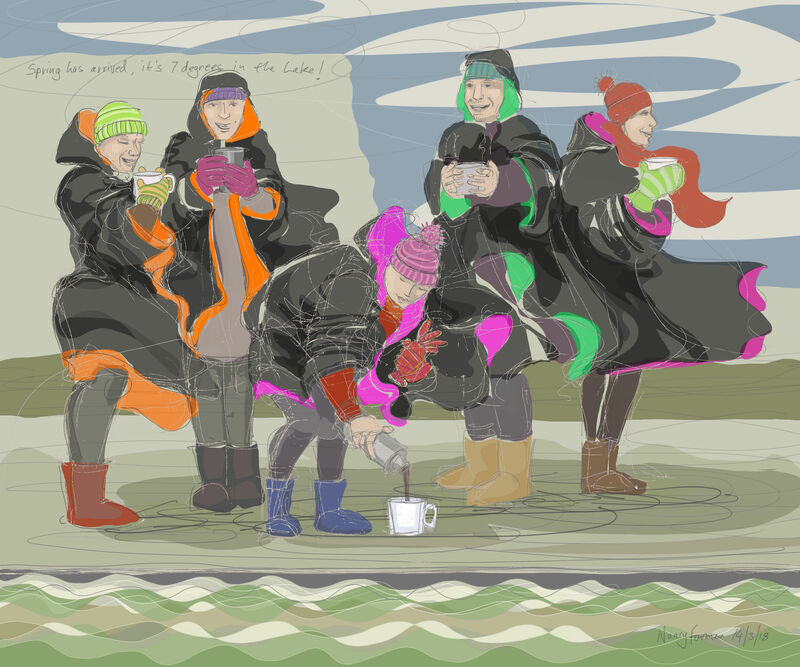 This entry was posted in digital, showcase, swimming and tagged art, Clevedon Marine Lake, cold water swimming, digital, digital sketch, drawing, Spring, swimming, winter swimming on March 16, 2018 by Nancy Farmer.